Several dog breeds have distinctive coat features and need constant grooming. Some breeds have a double coat, with the first one for insulation during winter and other for outer guard hair. The fur on some breeds thicken during winter, and the excess hair is shed in warmer seasons. Other than body temperature regulation, the hair on dogs helps them stay aware of their environment, especially in the dark. Shedding is one major issue associated with owning a dog these days. The hair growth is in cycles. Old hair falls off, and new ones grow again. In some dogs, grooming is required to help remove the dead hair. It is a normal phenomenon, depending on the type of dog breed. Frequent shedding may be caused by parasites, stress and other health challenges. Poor nutrition and improper grooming techniques may cause skin irritation and shedding hair in animals. The appearance of your dogs will help you to determine the health of your dog. Keen observation of your dog’s fur to see if there are any changes to its colour or the hair shedding frequency is essential to forestall any adverse health issues. Poor feeding routines, allergies or just a change in weather can affect your dog’s coat in adverse ways. While some people allow nature to take its course during fur shedding, others prefer using tools to remove dead hair and avoid creating a mess in their house. You may need to consult your vet before changing a hairbrush type. Also, note that shedding brushes are different from ordinary hairbrushes. Does My Dog Need a Shedding Brush? Dogs generally require a great deal of care and maintenance to keep them strong and healthy. Bathing alone may not be enough to keep their coats in good condition; good grooming routines are necessary to keep them looking trendy and vibrant. To help your dog stay cool and comfortable during warm periods, the surplus hair needs to be taken out. You will have hair-free clothes, and the amount of work you have to do during your house cleaning will reduce in turn. You need a shedding brush that can easily be disassembled for easy cleaning. Having a tool that is difficult to clean makes it difficult to use and may lead to the transfer of skin problems between dogs if you use it on more than one. Hair stuck on the brush may easily spread all over the house. When selecting a brush from pet stores, try to check how well they fit in your hand. Buy those with a good grip for easy handling, in case you have to use it for long hours. You also need to look at the size. Is it the right fit for your dog? Some brushes are wider than others depending on the size of your dog. You may choose to use narrow brushes for the tails and legs, and a wider one for other parts of its body. It is essential to consider the safety of your dog while choosing a shedding brush. Dogs have different fur types. Your dog will enjoy the process if you’re using the right brush type. While using a brush, you are expected to pay close attention to the way it affects your pet. If the tool irritates their skin or causes pain, they may avoid future grooming activities. You may need to talk to your veterinarian or read product review before making the decision on which brush to go for. Due to frequent shedding, some dogs require weekly brushing. Constant brushing does not stop your dog from shedding. Use of shedding brush helps eliminate loose hair from your dog’s coat before its shed all over the house. Furminator is used to take care of mats, and it can reduce shedding by 90%. It has a FurEjector button that handles the self-cleaning of the tool. The Furminator has a stainless steel edge and comes in different sizes for different dog breeds depending on the type of coat they have. Owners of dogs like German Shepherds, Chowchow and Saint Bernard will find this brush very useful. This rake is very useful for your shedding dog. Depending on the way it is used, it may be able to reduce shedding by a whopping 90%. It is not suitable for short-haired dogs as it may cause scratching and lead to irritation. It is ideal for dogs with thick undercoats to easily remove dirt trapped underneath the fur. It has a handle with a good grip for ease of use. These brushes are made of bristles of thin wire on a flat surface. It can help in eliminating hair tangles and mats from the coat of your dog. It is designed with a wide head for and a good handle for efficiency and ease of use. Loose hair can effectively be removed by this brush without irritating your dog’s skin. It has a self-cleaning mechanism that can be activated by the push of a button. This helps in grooming as often as you need without leaving a mess on furniture. For dogs with fluffy hair, brushes with wire pins are more effective as opposed to the natural bristle brush that could work for fine-coat dogs. The Oster brush sports the closely-packed traditional bristles on one side and wire bristles on the other side. It can be used for a wide range of dog breeds to remove loose hair and debris that is stuck in the coat. The side with the traditional bristles can be useful in massaging the body of the dog for a healthy skin. It has a sturdy handle that makes it easy to use for long hours. 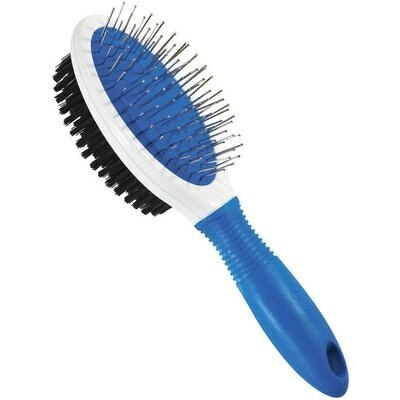 This brush has a bulky head with fine tightly packed pins for efficient removal of loose hair from the dog’s coat. It has a self-cleaning mechanism that retracts the pins for easy removal of accumulated hair after use. The pins are with great flexibility to eliminate discomfort when grooming your pet. It can be used on different dog breeds with long and medium-haired coats. Dog brushes have four major types. They are rakes, slacker, pin and bristle brushes. These brushes have one or two rows of closely arranged, razor-shaped pins. They can be very useful in removing dead hair deep in the dog’s coat. Avoid applying pressure when using this kind of brush, as they can penetrate thick fur and may scratch your dog’s skin. Dogs with thick fur like the Tibetan Mastiff, Saint Bernard, Cocker Spaniel, and German Shepherd need rakes to help remove hair tangles and debris that may be trapped under their coats. Knowing the hair length of your dog is key to choosing a rake with the right pin size. Short ones may not be effective in removing dead undercoat, whereas longer ones may cause pain or skin irritation. There is a wide range of slacker brushes available to dog owners, but the primary feature is its short, neatly packed wires. They are helpful in removing mats on dogs with long hair or those with curly hair. They can be used on dogs like the Husky, Samoyed, Golden Retriever and Malamute. Grooming these breed of dogs that easily develop mats with the right brush size that has a user-friendly handle makes the process an easy one. Gentle strokes with the brush will prevent pain that may be caused when tangled hair gets caught in the wires. These look like the regular human hairbrush. It consists of flexible wires with pin tips that are loosely packed. They are very affordable and are often used to round up the grooming process. They help remove loose hair that was missed by other brushes. They are made of bristles that are closely They are useful in massaging the dog’s skin and the removal of dead hair to keep the furniture and clothing hair-free. Bristle brushes may be used of dogs with short hair that shed often like the Scott Terrier, Pug, and Greyhound. As you brush your dog often, the activity becomes easier as it gets used to the process. You need to know the type of coat your dog has, to help you to decide on the best dog shedding brush to buy. After picking the suitable shedding brush for your pet, you need patience because it will take some time before your dog gets used to the activity. You need to be very gentle during the de-shedding routine. It is necessary to wash dogs first before manual shedding. Bathing the dog softens the fur and helps remove some loose hair or dirt trapped in its fur. Endeavor to use a mild shampoo that will not irritate your dog’s skin. The dog’s coat should be dried after washing. A blow dryer may be used for dogs with a thick coat. Then a dog shedding brush can be used to remove the remaining loose hair afterward. Do not rake in an angle opposite to the direction of growth of the fur on your dog. Gently stroke the coat from head to tail systematically. Be careful when raking the belly and other sensitive areas of the dog to minimize stress, as it could be very uncomfortable for your pet. Too much pressure on a particular area of the coat may lead to skin irritation. Always remove excess hair that collects on the bristles of the brush before continuing. You may need to place a clear plastic over the floor to collect loose hair while de-shedding. Endeavor to clean the shedding brush after use and safely keep it away for future use. Grooming is one of the major activities a dog owner would undertake to maintain healthy canines. Using the right dog shedding brush makes the process an easy one. All dogs shed hair regardless of their breed of the nature of their coat. We have provided top quality dog shedding brushes from the good brands in the market. You can pick the right one that suits your pet according to the size of your wallet. Our pick for the best dog hair shedding brush is the Furminator because of its ease of use and self-cleaning capability. However, you should note that dogs have different temperaments and they may not like it just because you do. Be patient with your dog and apply minimal pressure when using these brushes to achieve the best results.